The card game Accordion is also known as Methuselah, Tower of Babel, or Idle Year (presumably because of the amount of time you need to keep playing the game to win it). Accordion is a charmingly straightforward game that can easily seduce you into assuming that it must be easy to solve. Be warned — we’ve never known anyone who has completed a game of Accordion! This challenge makes success at the game doubly pleasurable. Accordion also takes up very little space — a major benefit because you tend to play Solitaire in a cramped space, such as while waiting in a bus station or an airport gate. The objective of Accordion is to finish up with a single pile of 52 cards. Relative success is reducing the number of piles to four or fewer. Your chances of complete victory may be less than 1 in 1,000, but don’t let that deter you from giving this game a try! The fact that it is a very fast game to play means that you can abandon unpromising hands and move on to another without wasting much time. Shuffle the deck well, and then turn over the top card in your deck and put it to your left to start your layout. Turn over the next card. If the card is either the same suit (both clubs, for example) or the same rank (both jacks) as the first card, put the second card on top of the first. If you don’t have a match, use the card to start a new pile. Turn over the third card and compare it to the second card. Again, if the suits or ranks of the cards match, put the third card on top of the second card; if not, start a third pile with the third card. You can’t match the third card with the first card. However, when matching cards (of suit or rank) are three cards apart, you can combine them as if the cards were adjacent. In other words, you can build the fourth card on the first one. Continue by going through every card in the deck in this way. The game ends after you turn over the last card. To win, you must assemble all the cards into one pile. Shuffling the deck well is important because you work your way through the deck one card at a time, so you don’t want to make the game too easy by having all the diamonds coming together, for example. That would spoil your sense of achievement, wouldn’t it? Your initial cards may look like one of the examples shown here after you lay out three cards. At the start of Accordion, your cards may fall in this manner. In the first example, you must create three different piles because the cards are unrelated in rank or suit. 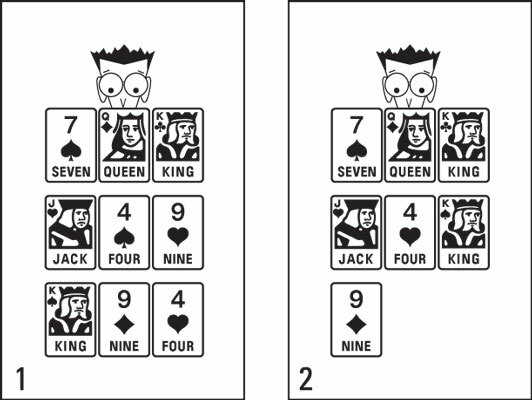 In the middle example, you can put the 4 of diamonds on top of the queen of diamonds (because they share the same suit), leaving you with only two piles. 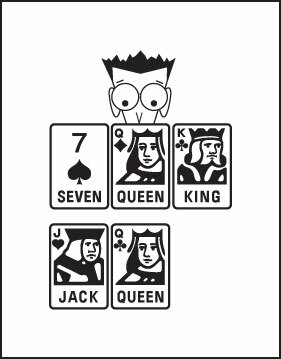 In the last example, you can put the 7 of diamonds on top of the queen of diamonds, which allows you to combine the two 7s, resulting in a single pile. To see how you can combine cards placed three piles away from each other, look here. You can match cards that are three places away from each other to further your game progress. After you turn up the queen of clubs, you can place it on the queen of diamonds (because they’re three apart and match in rank) and then put the king of clubs on the queen of clubs (same suit). The jack of hearts then moves to the first row. Laying the cards out in lines of three helps ensure that you properly identify the cards that are three piles apart. When moving the cards, you frequently have to be careful to make the plays in the correct order to set up more plays. You may have a choice of moves, but you may not be sure which move to execute first. Look at a possible scenario shown here. Look ahead to see which move to make first. After you turn up the 4 of hearts, you can place it on the 9 of hearts, which opens up a series of moves that you can play. The best option is to move the 4 of hearts onto the 4 of spades and then move the rest of the cards into their new spaces. Because the king of spades is three cards away from the king of clubs, you can combine the two cards and then move the 4 of hearts onto the jack of hearts. Now the 9 of diamondsis three cards away from the queen of diamonds, so you can combine those two cards. If you move the 4 of hearts before you move the king of clubs, you miss out on two possible moves. Making an available play isn’t always mandatory. When you can choose between possible moves, play a couple more cards to help you decide which move is superior. The figure shows you how waiting can help you make up your mind when you have a choice. Playing the waiting game can help you make up your mind. At this point, you may not know whether to put the ace of spades on the ace of clubs or on the king of spades because your piles don’t indicate whether you should keep aces or kings on top of your piles. If several piles have kings on the top, you may want to avoid hiding the king of spades. Instead of jumping the gun, you turn over another card to see what happens, which turns out to be the jack of spades. Now you can see daylight: Put the jack of spades on the ace of spades and then on the king of spades, and then you put the jack of spades on the jack of hearts. Now you can combine the 9s. 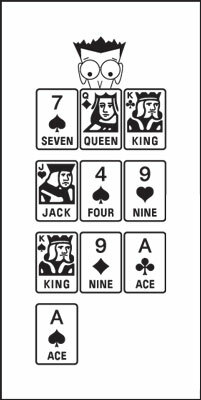 Next, put the 4 of spades on the jack of spades, allowing the ace of clubs to go on the king of clubs and the 9 of diamonds to go on the queen of diamonds. Put the 4 of spades on the 7 of spades to move down to three piles. Wasn’t that fun? Getting a series of moves to come together like that makes up for the hundreds of unexciting plays you go through. Play continues until you end up with one pile of cards — good luck!